Ram Navami is the day on which Lord Rama, the seventh incarnation of Lord Vishnu, incarnated in human form in the land of Ayodhya. He is the ardh ansh of Vishnu or has half the divinitive qualities of Lord Vishnu. The word "Rama" literally means one who is divinely blissful and who gives joy to others, and one in whom the sages rejoice. Ram Navami falls on the ninth day of the bright fortnight in the month of Chaitra (April/May) and coincides with Vasant Navratri or Chait Durga Puja. Therefore in some regions, the festival is spread over nine days. This day, marking the birthday of Lord Rama, is also observed as the marriage day of Rama and Sita and thus also referred to as Kalyanotsavam. During the reign of king Dasarath, Ayodhya reached a period of great prosperity. However, Dasarath faced the issue he had no children. Therefore, he decided to perform a sacrifice known as "Ashvamedh " a special horse-sacrifice. The performance of this sacrifice was a great event in Ayodhya and at the end, Rishyashring recited a mantra and made an offering to the fire while the gods, Gandharvas, Siddhas, and Rishis present there began to pray to Lord Brahma, the Creator of Hindu Trinity. At that time, Ravana (king of Lanka) was terrorizing the people, and all were longing for liberation from his menace. Ravana was invincible, because Lord Brahma gave him a boon according to which, he would never die at the hands of gods, or Gandharvas, Or Yakshas (demigods) or demons. As he was not afraid of humankind, he did not care to include men in the list of his potential slayers. Therefore, Brahmadev declared that Ravan would die at the hands of a man. It was then the gods went to Lord Vishnu with the following request, "Dasarath is a glorious king. Please, take birth in the wombs of his three queens in four different degrees of your divinity." When Dasarath's sacrifice ended, a shining figure appeared over the sacrificial homa kund, and offered the king a divine beverage called "payasam" to be given to his queens Kausalya, Kaikayi, and Sumitra. 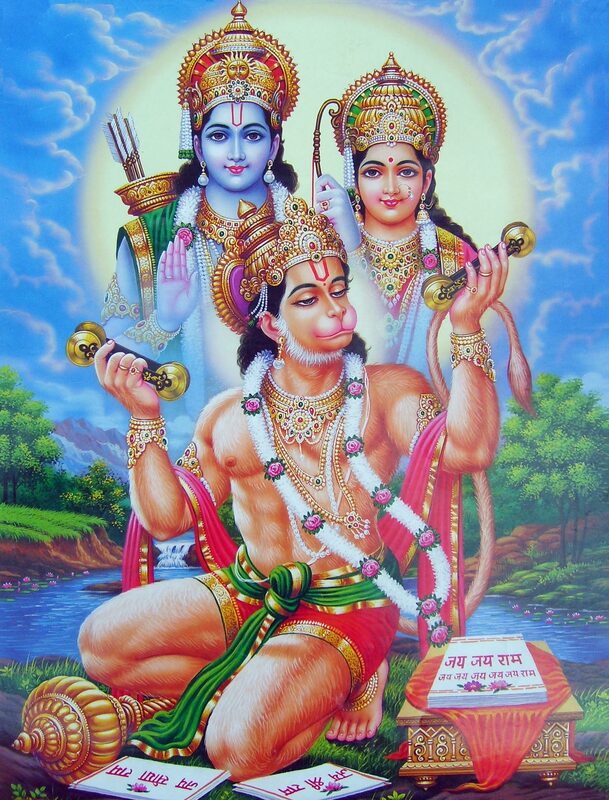 In due time, Kausalya gave birth to Rama, Kaikayi to Bharat and Sumitra to Laxman and Shatrugna. Rama was born at noon of the bright ninth day of Chaitra and is believed to be the embodiment of half degree of Vishnu's divinity, (Ardha Ounsh). The Sun is considered to be the progenitor of Rama's dynasty, which is called the Sun dynasty (Raghukula or Raghuvamsa, Raghu means Sun and Kula or Vansa mean familial descendant). Rama is also known as Raghunatha, Raghupati, and Raghavendra etc. That all these names begin with the prefix Raghu is also suggestive of some link with Sun worship. The hour chosen for the observance of the lord's birth is that when the sun is overhead and is at its maximum brilliance. Significantly, the ancient Egyptians termed the sun as Amon Ra or simply as "Ra". In Latin, the syllable Ra is used to connote light. For example, we have Radiance which emission of light, or Radium, which means any substance emitting light or brilliance. The common element is the syllable Ra that in many languages is used to derive words for describing Sun or light and thus the legend of Sun Worship. In Andhra Pradesh, Ram Navami is celebrated for 10 days from the Chaitra saptami to the Bahula Padyami that fall in the month of March and April. Temples re-enact the marriage of Lord Rama and Sita to commemorate this event, since this day is also the day they got married. Apart from that people celebrate the special occassion by fasting till noon and doing the akhand Ramayana paath or the sunderkand paath. No good if he's not born in you." Happy Shri Ram Navami Friends! !